We’ve mentioned a couple times all ready that this month is going to rule and that there are gonna be some sick shows going on. One that’s got us really stoked is Miss Peach Kelli Pop making her first trip to Nashville at the end of May [Monday the 30th] You probably recognize her as the drummer from Ottawa’s White Wires [who will hopefully roll through town sometime soon, too] Her debut LP was released last year from Going Gaga and is currently being reissued by our favorites over at Infinity Cat right now. No word as to if they’ll have them by showtime, but we’re hoping so. 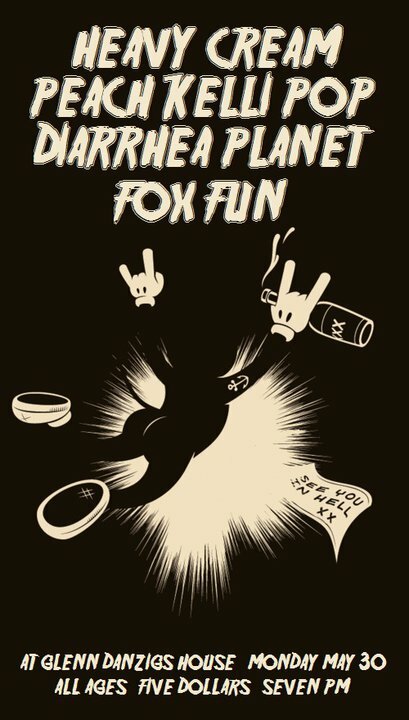 The party’s going down at Glenn Danzig’s House [click down there to check out the flyer, it’s pretty sick] alongside the Creamiest Creamies, the Doodoo Boys, and the Fox Fun. Get stoked!